Neonatologist Stewart Lawrence, M.D., was recently honored as a 2014 NICU Hero by Mead Johnson Nutrition and Hand to Hold, a national nonprofit Neonatal Intensive Care Unit (NICU). Dr. Lawrence practices at Saint Alphonsus with Mountain States Neonatology, an affiliate of Pediatrix Medical Group. Sophie Carney, of Meridian, nominated Dr. Lawrence for his compassionate and excellent care following the birth of her twin girls at 25 weeks and six days gestation. Her twins were born shortly after she underwent a procedure to treat a life-threatening fetal condition known as twin-to-twin syndrome, or TTTS. TTTS is a rare condition that causes one twin to grow larger and another to fail to grow. The condition appears in less than 20 percent of identical twins and occurs when the blood flow through their placental connections become unbalanced. One twin does not get enough blood while the other becomes overloaded with too much blood and fluid. Babies who survive TTTS during gestation may face a range of health problems resulting from both TTTS and premature birth. Carney says Dr. Lawrence became her constant source of communication as a NICU team cared for her girls for nearly 20 weeks. Dr. Lawrence was involved in their day-to-day care, and he knew the big picture – the overall path to their long-term health. I realize that many people do not get this kind of care. Not only is he paying attention to all of the details, but he also has such a good bedside manner,” Carney says. “Neonatal healthcare providers know how the trauma of a baby’s NICU stay can affect the entire family and the very real difference family-centered care can make for parents and their baby,” says Kelli Kelley, founder of Hand to Hold and mother of two preemies. The compassionate care Kelley received, and has also seen medical professionals give other parents, is the driving force behind creating the annual NICU Heroes Awards. The NICU Heroes Award includes a $2,500 donation in the winner’s name to the pediatric healthcare charity of their choice. Dr. Lawrence designated St. Jude Children’s Research Hospital to receive his honorarium. 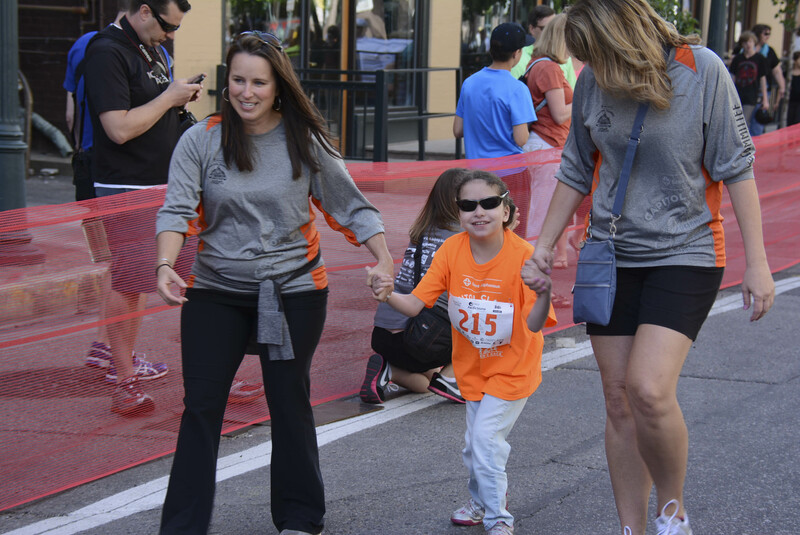 St. Jude is a research and treatment facility for catastrophic diseases in children, primarily pediatric cancers. Mead Johnson Nutrition partnered with Hand to Hold to create the NICU Heroes Award to reward the experience, professionalism, support and deep compassion these NICU health care professionals give their patients and their families. Families from 30 U.S. states nominated neonatal nurses, physicians, and other healthcare professionals who helped make a difference for their preterm or medically fragile newborns. Happy Birthday Idaho, and America! I love the 4th of July! We are so blessed to live in a free country and I love the opportunity to celebrate our nation’s birthday. It might be because I grew up as an ‘Army brat,’ living on post, and waking up to reveille being played every morning. It was impressed upon me at an early age what a privilege it is to live in the United States and to have a military that is devoted to keeping our freedom. I made certain to pass this patriotism along to my family. I think it worked, as you can see by the photo I received of my granddaughter, Siena, who is ready for the 4th of July. I just love her boots! July 3rd is also the 124th birthday of Idaho. This is truly a great state and I am so happy to live and work here. It was a mere four years later after statehood was granted that Saint Alphonsus was established in Boise by the Sisters of the Holy Cross, in 1894. So please enjoy the 4th of July holiday, and remember to thank those who are currently serving, and honor those who have served, in our U.S. military. The 2nd anniversary of Meet Me Monday was celebrated June 9 with an enthusiastic crowd of 165 participants. 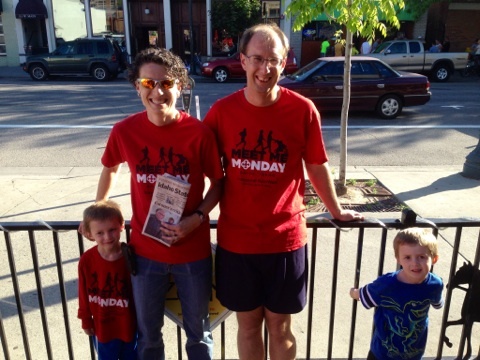 Of course, the Orth family (Brian, Toni, and twins Taylor and Tyler) was on hand for their 104th Meet Me Monday in a row! They haven’t missed one yet and even celebrated the twin’s 4th birthday on June 9. 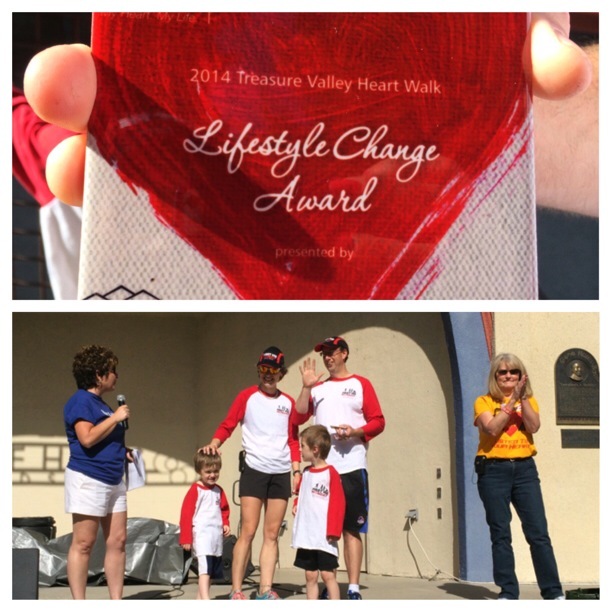 The family has been recognized by the American Heart Association Heart Walk with their Lifestyle Change Award for their perfect attendance and Brian’s 80-pound weight loss since they started Meet Me Mon day. Congratulations! Meet Me Monday is spreading throughout the Treasure Valley. Meet Me Monday in Kuna recently celebrated their one-year anniversary under the leadership of Saint Alphonsus Dietitian Liz Warhurst. Meet Me Monday in New Plymouth will be celebrating their first anniversary in September. It is exciting to see people becoming more engaged with their health and we will continue to encourage and support people in their quest to live healthier lives. We want to be your trusted partner for life and together we can make it a long and vigorous life. 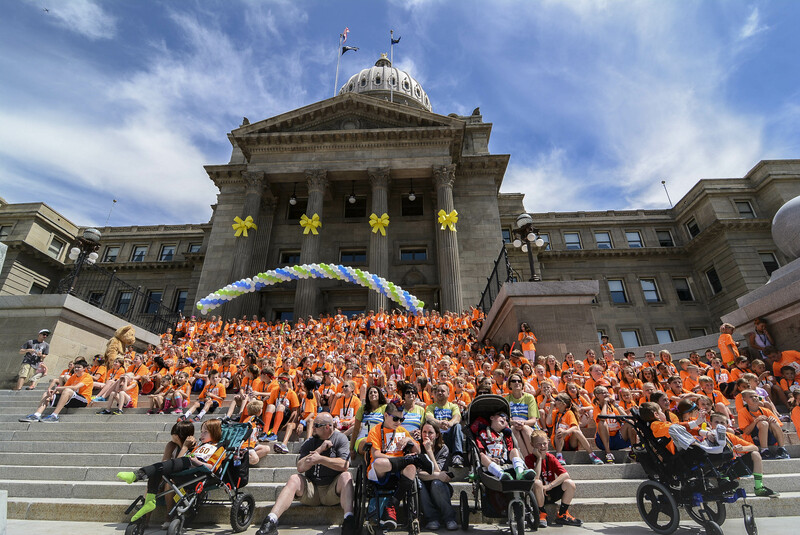 It was a splendid day for the 32nd annual Capitol Classic Children’s Race, the one-mile race from just below the Boise Train Depot to the Idaho State Capitol. 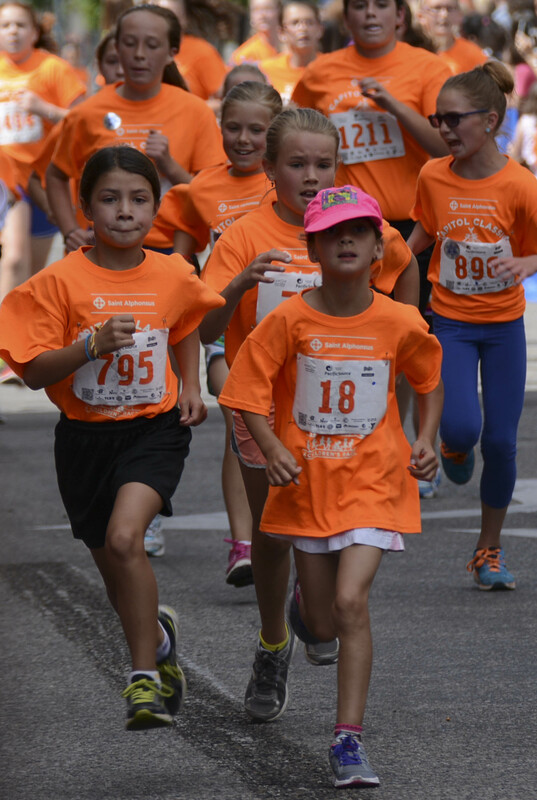 The sea of orange shirts was quite the sight as over 1,300 kids, ages 6 through 14, ran or walked their way down Capitol Boulevard. 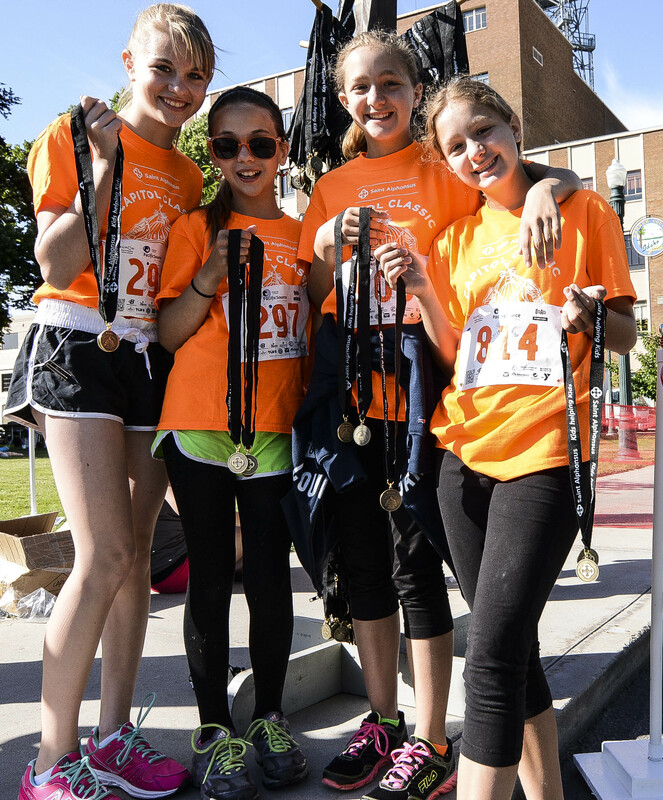 Saint Alphonsus is dedicated to the importance of physical fitness for our young people, and this race is one way to get kids excited about running and participating in physical activity. 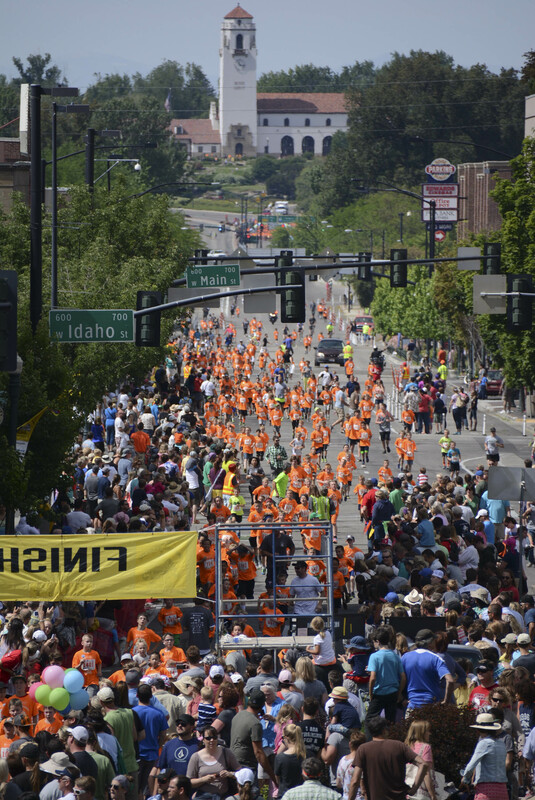 Who knows, maybe someday one of these race participants will be in an Ironman Boise 70.3! our emergency department and are in need of some special comfort. It is heartwarming to know that besides getting exercise, kids are helping kids in their time of need. What’s Not to Love About Mondays? I am always pleased when we can provide opportunities for better health and involve the whole community in doing so. One of our fun programs to do just that is Meet Me Monday. I have asked Corey Surber, Director of Community Health Initiatives for Saint Alphonsus, to share her insights from Meet Me Monday as the program celebrates its upcoming second-year anniversary. Sure, Mondays aren’t known for being the most popular day of the week. Garfield the Cat famously despised Mondays for whatever reason, and in the 1960’s the Mamas and the Papas sang “whenever Monday comes, you can find me crying all the time (in Monday, Monday).” Despite the bad rap, Mondays have really grown in popularity in the Treasure Valley over the past two years – WHY?? Meet Me Monday, that’s why! 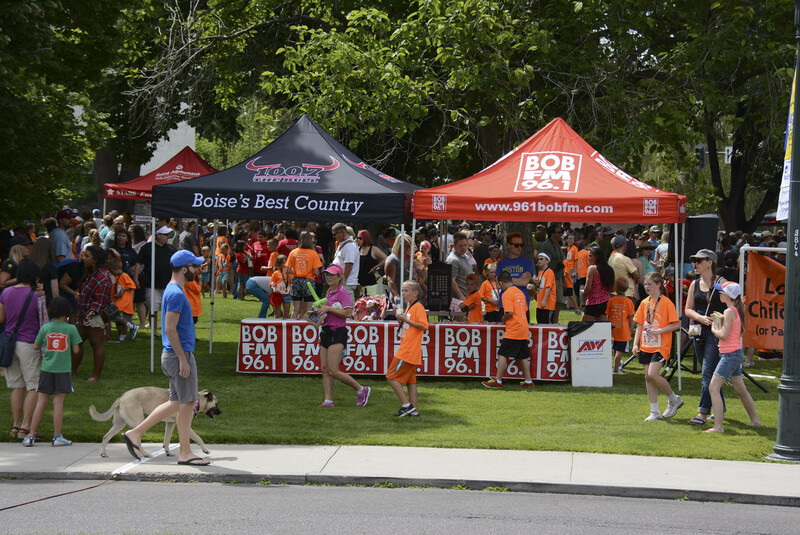 Meet Me Monday began in Boise in June 2012 as a health partnership between Saint Alphonsus and Bandanna Running & Walking – offering a free, weekly family fun run/walk EVERY Monday year-round, through sun, rain, snow, sleet, wind and even holidays. 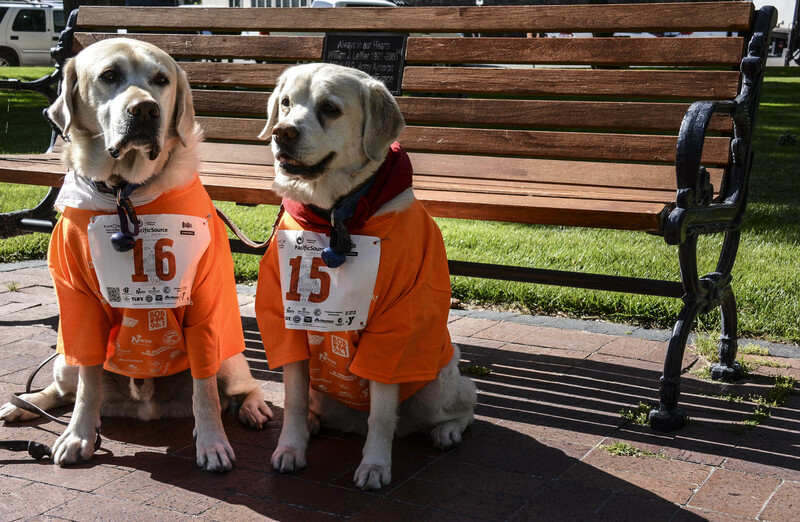 There are suggested routes of 1, 2, and 3 miles but participants can choose to walk or run wherever they prefer, and it’s not a timed competitive race so our athletes just sign in and head out when they arrive. The MMM movement has now spread to Kuna and New Plymouth and more communities across the valley have plans in the works! The Orth Family haven’t missed a Monday in two years! While Mondays do tend to be a tough day for most of us mentally — going back to work or school, getting back into the weekly routine – our Meet Me Monday (MMM) athletes have found if they commit to starting each week off on a healthy foot, it’s easier for them to set a healthy pattern incorporating physical activity and fun throughout the whole week. Take the Orth Family as an example – Brian and Toni Orth have brought their twin boys Taylor and Tyler to EVERY SINGLE MMM since we started in June 2012. When MMM began, the boys wheeled along in a stroller as their parents walked or ran their MMM route through downtown. 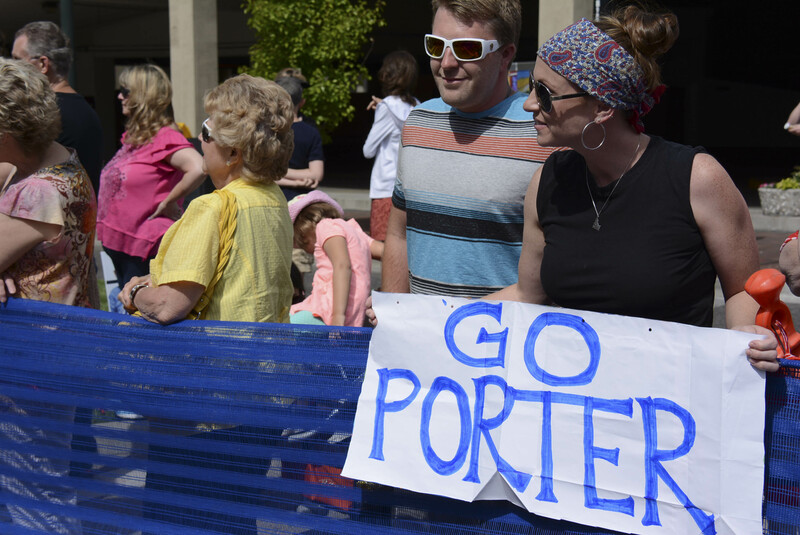 Nowadays, the boys run along ahead of their parents on their route, excited to see the “Water Monster” (the fountain at Boise City Hall), and Brian has lost an incredible amount of weight since the family started getting out with MMM every week. What keeps individuals and families coming back to MMM? Whether it’s the opportunity for social time and support for living a healthy lifestyle, the free prize drawings, discounts at downtown businesses, the beautiful walk or run downtown, or the incentives for repeat participation, the great thing is that people DO keep coming back. 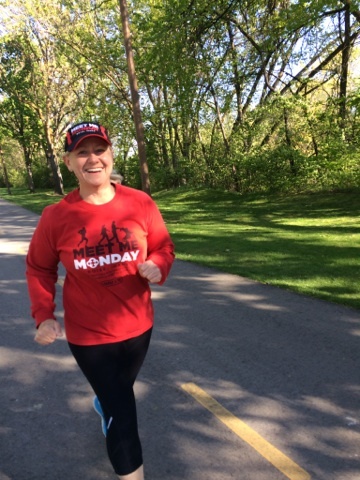 When MMM celebrated its 100th consecutive Monday in May, the Orth family were the first to receive their 100-timer shirts and couldn’t wait to put them on to show their accomplishment as a family. Connie Pond staying in shape! 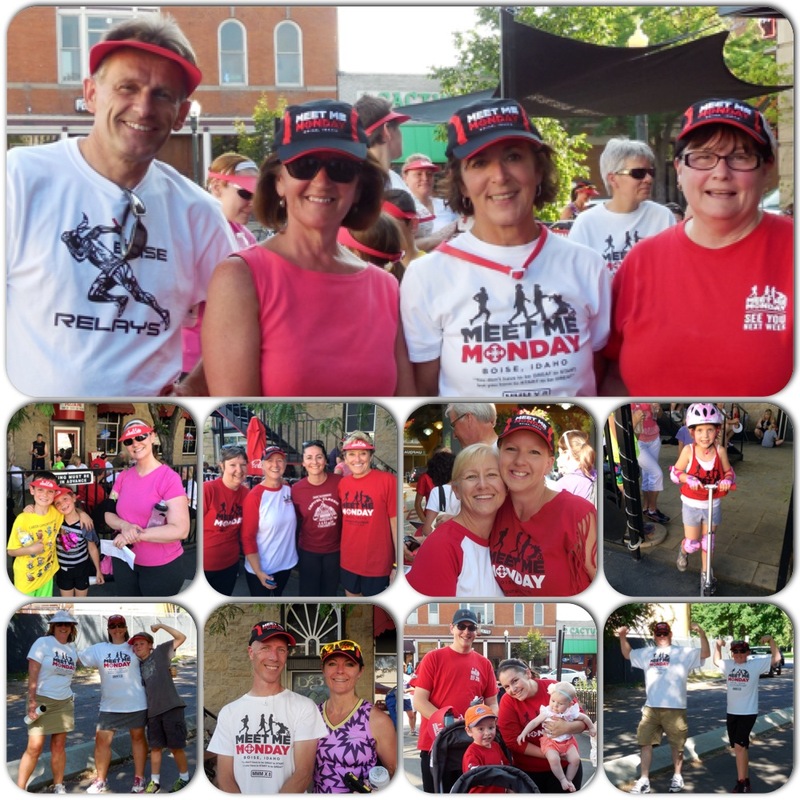 Since then, more 100-timer shirts continue to be awarded each week and we continue to be amazed by stories of health transformation among our MMM athletes. Connie Pond proudly stepped up to receive her 100-timer shirt recently with her husband Dwight, and she has a lot to be proud of. She modeled in the Festival of Trees Fashion Show last November and was a finalist for the American Heart Association Red Dress Award this past February, recognizing her healthy lifestyle makeover and amazing 30-40 pound weight loss since starting MMM. gear on vacations with them, and if they are somewhere other than Boise on a Monday, they put on their shirts, take photos and post them to the Meet Me Monday Facebook page to show they are still with us in spirit, getting out for a walk or run to start the week even though they are far away. 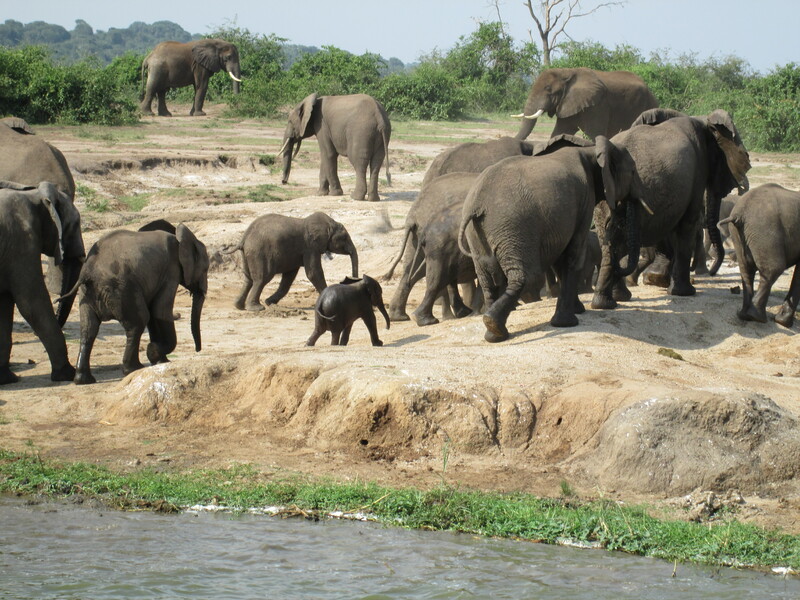 Their photo posts from China, Africa, Alaska, Washington DC and elsewhere are an awesome demonstration that Monday is far from the least popular day of the week, at least for those who have tried Meet Me Monday! Please come join us June 9th as we celebrate two years of marvelous Mondays, and make MMM a part of your weekly recipe for good health! Sign in starts at 5:15pm every Monday at Bandanna Running & Walking, with announcements, prize drawings and the “GET OUT” cheer at 6:45 pm. For more information about MMM including start times and locations for Kuna and New Plymouth, please visit www.MeetMeMonday.org and “like” our Meet Me Monday Facebook page! This week is National Hospital and Healthcare Worker week, which provides a great opportunity to reflect on the impact hospitals and the people who deliver health care have on their communities. At Saint Alphonsus, we see our hospitals as more than a collection of buildings where people come for their health care. Our hospitals and healthcare providers are involved in the community, engaging people in living healthy and full lives. One good example of this is our Meet Me Monday program in downtown Boise, where we invite the community to walk a one, two, or three mile route with us each Monday evening. This fitness program combines healthy physical activity with social interaction, and fosters an environment that promotes longevity and disease prevention. 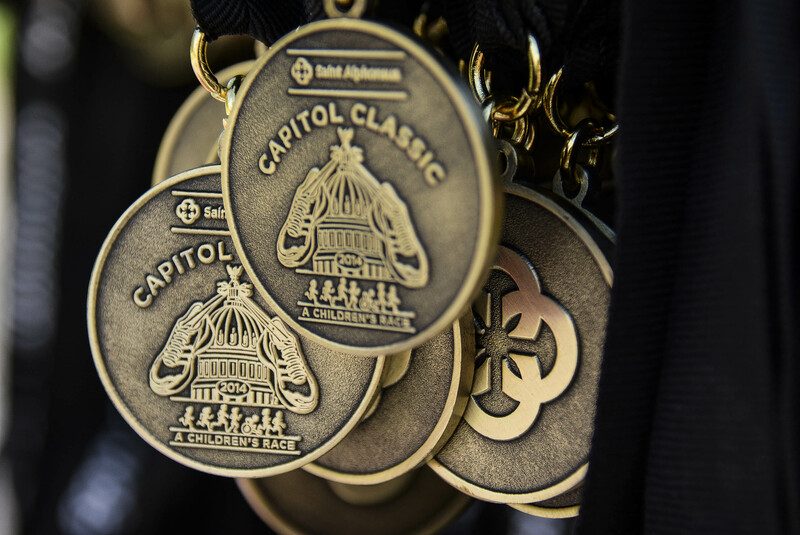 The same goes for our 32nd annual Capitol Classic coming up on June 7. 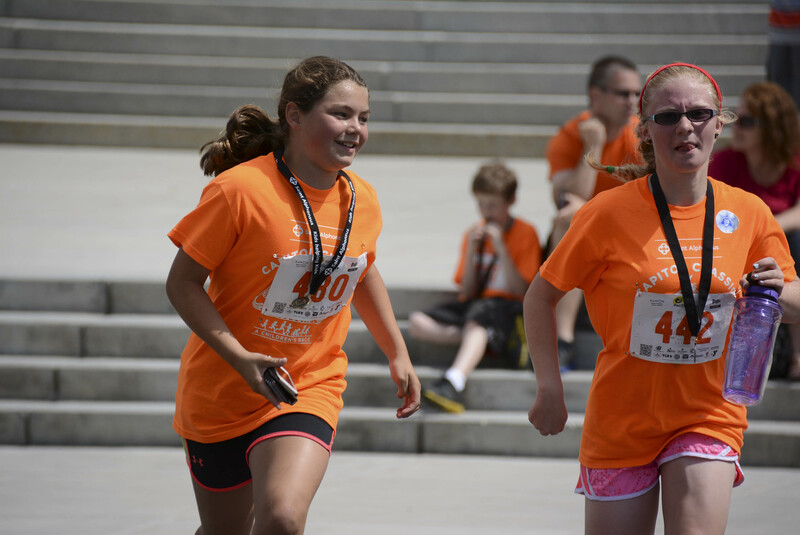 This one-mile foot race is open to kids of all abilities from ages 6 to 14. 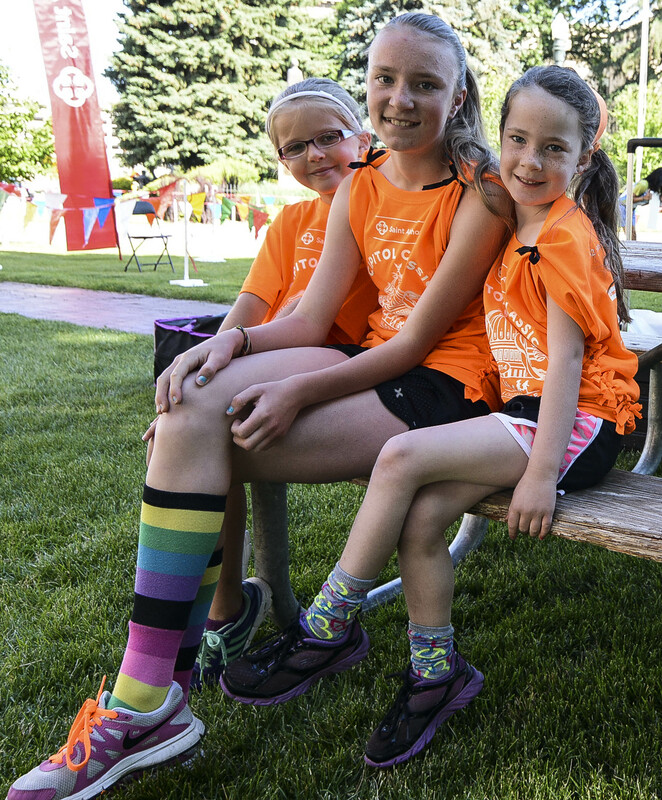 Thousands of kids experience the unique opportunity to run down Capitol Boulevard, starting from the Boise Depot and finishing at the State Capitol, enjoying the benefits of exercise with kids their own age. Our hospitals host free screenings and discussions on health issues, as well. Skin cancer, mammography, bone density, and lipid information are just some of the screenings offered throughout the year. Our hospitals are also the place where meetings are held and plans are made with other community-minded organizations. 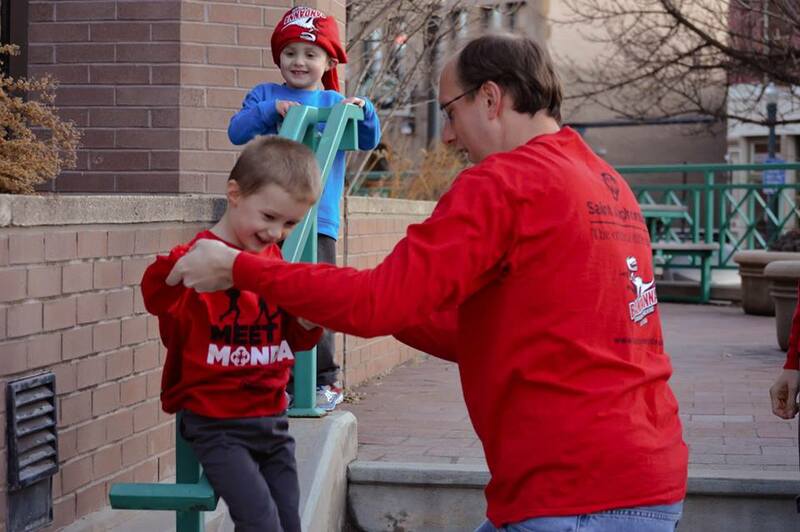 For example, Saint Alphonsus and the Blue Cross of Idaho Foundation for Health with their High Five Children’s Health Collaborative teamed up on GoNoodle, a desk-side physical activity program for school kids – provided free of charge to southern Idaho schools. In addition to our community events, our hospitals put a priority in providing compassionate and quality care to everyone who comes through our doors. 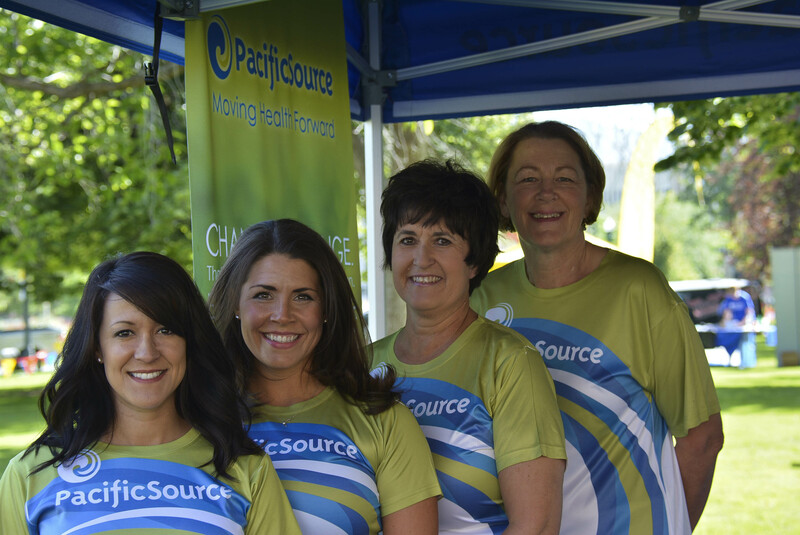 We continually invest in training, resources, and technology to offer the best care possible. Our biggest investment is also the most important – our people. The healthcare workers in our hospitals, clinics and other facilities take great pride in providing compassionate care. These men and women are dedicated to improving health – and they are extremely good at it, I might add. While having a new facility like the Birkeland Maternity Center and the Heart Center we opened earlier this year at I-84 and Garrity Boulevard is wonderful, it is only a start to great care. That comes from all of our people who work to deliver a healthcare experience that exceeds a patient’s expectations, and keeps the health needs of their community a priority. care provider for the work they do on behalf of so many. They deserve it.